Before I show you the art for this week's Caturday Art Blog Hop I'd like to thank you all for your comments on our last post. I am feeling better now, but Mum has been trying to make me eat wet food and I haven't eaten that since I was a kitten. I just won't touch it! She has been trying to switch my food for ages. She tells me she is doing it for my own good because dry food isn't healthy to eat all the time. She thinks that's why I had the urinary problem the other day. What do you furry friends eat? Do you prefer dry to wet? Does your human make you eat things you don't like? We didn't have time to do much 'art' with this photo. It is quite simple. Mum just created it using her old favourite Pixlr. In this photo I was napping on Mum's lap yesterday morning while she was giving me Reiki. She added the green light because this is a healing colour and it's the one she pictures in her mind flowing from her hands as she does the healing. It's a very nice art picture ! To your question, from my 4 cats they all eat wet food and sometimes when there is nothing in the bowl dry food.since they were kitten. Only Rosie eats special dry food for fragile stomach and I feed her apart. Pookie now that she is 17 needs wet food so I always add water to the wet food to make it like a soup. She has kidney problems. That works very well. I don't want to take her to the vet yet, because she has a shiny fur, and doesn't suffer. Besides that she eats like a horse ! and remains a skinny minnie ! Maybe the wet food you give tastes not so good, Try another brand. I also noticed that Pookie loves fish more than meat ! I had to try out 3 different brands until I found the one she likes ! We only wet. Da mommas swtiched to an only wet diet years ago when Maurice had a urinary blockage - it's all we've ever had since we wuz babies. Glad you are feeling better , Athena ! Thank you. Yes, I am trying different brands. I've tried feeding her fish but she doesn't like it at all. Thanks. Glad you are eating a wet diet as well as dry. This is what I want for Athena. We all eat canned here - we never get kibble, except maybe as an occasional replacement for treats. But we usually eat healthier treats too, like freeze-dried chicken. We also eat a bit of raw food for dinner. We actually eat better than my human! Thanks Summer. Hope Athena will start eating wet and canned soon. I will buy only the ones with higher meat content and not the cheap supermarket brands. suhweet Reiki picture!!! Re wet/dry, mine eat 75% wet but I give them alittle dry. Buy grain free as much as I can afford, about 50% grainfree. Blessed be that cat with a mindful owner, Marie, Athena is a lucky feline! We're glad you're feeling better. That's pawsome artwork! Athena you are always gorgeous. WE are sorry we have been unavailable because our Mom is going through a difficult life transition right now. but she is still feeding us our wet food. WE love wet nommy gravy goodness. But she gives us all 1/2 c of crunchies. She knows dry isn't good for us but she thinks between 4 cats 1/2 c isn't bad. We mostly eat dry food as it cleans our teeths. We all like wet though and we gets it on special occasions as a treat. We also drink plenty of water. We love water, all of us drink a lot of it. We love the picture of your Mom healing you. Mommy says the green light makes her think of growing strong and healthy. This year Mom switched us to Science Diet CD, wet, for my (Toby) UTIs. Turns out I was having sterile cystitis issues, and the vet wanted us on this food. We haven't had any problems since. You look lovely, Athena!! Mum gives me wet and dry, but I do prefer the kibble, so she gives me wet with some crunchies on top to help me like it MOL If I had the choice I would probably just eat dry! Thank you. Sorry your Mom is going through a hard time. Purrs and hugs to her. We'll visit soon. Thank you. Athena loves water too. I should never have given Athena kibble. She loved wet food before. When I adopted her I fed her Felix Kitten pouches because that's what she was given at the rescue shelter. Then when she got older I switched to dry. Big mistake! I think she's addicted. So sorry you are not feeling well, but lucky you to have a Mom that can do Reiki. I know that helps make you feel better. As for my cats, they get a little dry and a little wet with each meal, but I do know people who feed strictly dry and it doesn't seem to be a problem. There are many different "therapeutic " foods we can get at the food store made by Science Diet. My two boys are on DM because they are diabetic and the vet says it has in it was every cat should be eating ... so maybe you could look into something like that. I have one picky eater and yes, it would be Diva the Devil Child. I have to give her a different flavor ever few days or she will walk away from it. There are only so many choices that she will eat though so it is hit or miss every meal time. If Athena is having kidney issues she needs to cut down on the protein ... best to look into a diet that will work for her ...i.e. maybe talk to your vet about it to be safe. Hope she is feeling better and love her green healing colors in you picture. 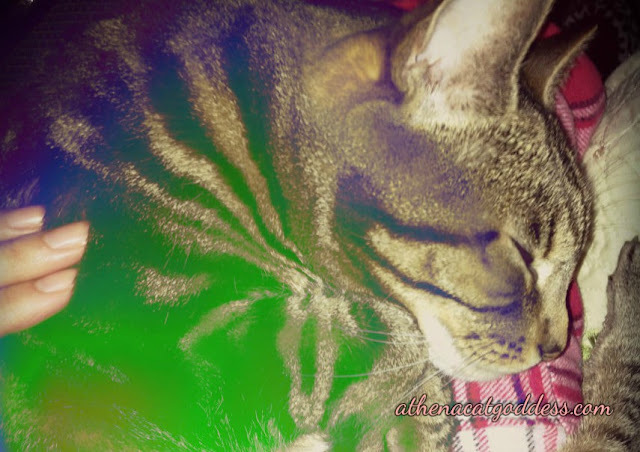 Such a cute profile picture of you, Athena, and with such lovely colors! I hope you get to feeling much better. I feed my cats both dry and moist food. Although they all beg for it like it's the best thing in the world, none of mine consistently eat moist food unless I work at it. Some flavors and brands just don't appeal to them. I strive for the benefits of moist food for their urinary tracts, though, so I get a variety of flavors and brands that I've narrowed down as their favorite, and I change it up daily so that they don't get bored with this one or that one. Also, my kitties will only eat pate moist food (they won't eat cuts, shreds, morsels in gravy, etc. ), and only if I add even more water to it. My girl Thimble likes to eat her moist food as soup, just as my angel Rosie did. So, I add water and stir up some soup. Next Monday’s post concerns my diet and what I want to eat as opposed to what TW gives me. Sending you healing purrz. Love the green. Mudpie prefers dry food over wet too. It took me a while to find wet food that she consistently likes, so now she's eating about 50/50. They certainly don't make things easy on us, do they? I'd turn green too if my mom tried to make me eat stuff I don't like. The only time that happens here is when I must take medicine, and then down the hatch it must go. I like dry food, but I eat wet food too. My diet is probably 60% dry 40% wet. Mom prefers I eat more canned food because that extra moisture is good for kidney health, but she's not bonkers about it and she's not going to take my dry food away. Indoor kitties have limited pleasures, and if dry food is one of them, she's ok with that. What a great picture of yous! And mes so happy that yous is feeling better. Being ill is NOT FUN!!! Thanks for your reply. The vet gave her a special diet food but she won't touch it. So far she seems better so I don't think she needs it anyway. I think her issues are stress-related like the vet said and probably has something to do with the booster she received the other week (which he won't admit). I will persevere with the diet. Give her more wet than dry. Thanks. I think cats love cheese but I wonder if it's any good for them? I used to give her some cat treats that had a cheesy centre and she became so addicted! I'm glad she has variety, which is good. If I can get Athena eating 50/50 it would be purrfect! Yes, the moisture in diet is very important. Even though Athena drinks water I still think a more moist diet is better. We eat wet twice a day, and get some kibbles left out to nibble on throughout the course of the day. This picture is so precious. I'm glad to hear she's doing better! Annie and Pierrot eat both, wet in the morning and dry in the evening and in between sometimes. The most important thing is she eats, even if that means dry. Annie is very picky about her wet food. Athena probably drinks more water if she eats just dry so she's still getting moisture. Cats drink when they're thirsty so she'd probably drink less if she ate dry (at least that's my experience). I did see it, Caren. Yes, I'll try that, though she does drink a lot of water. Thank you. Athena loves water. Sounds like a good diet!